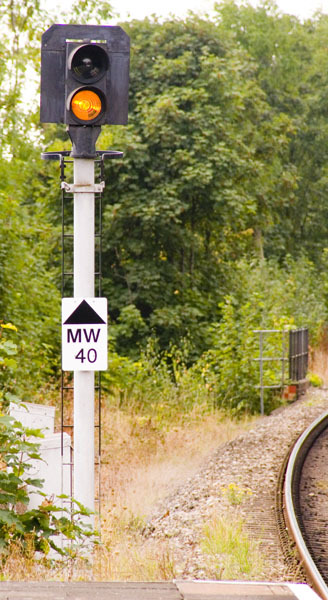 The signals at Malvern Wells were always my local ones as a kid. 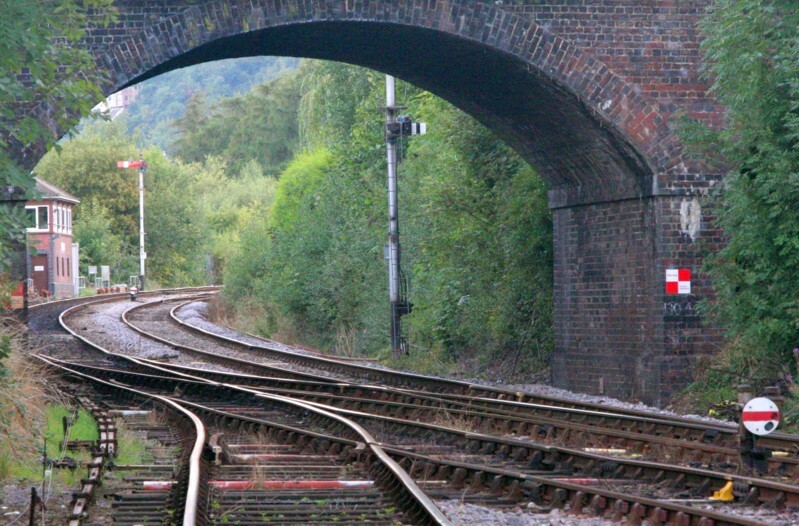 My grandfather had been stationmaster there on the GWR, and my parents frequently brought us to the Wells Common here to play, where a stream runs under the line and I could observe the signalling and train movements close at hand. 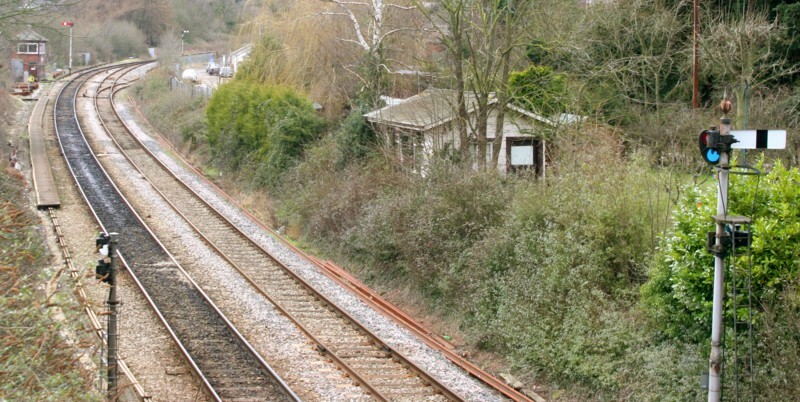 The layout here has changed little since the late 60s, when the double-to-single-line junction was moved from the Colwall Tunnel mouth to its present position near the signalbox. 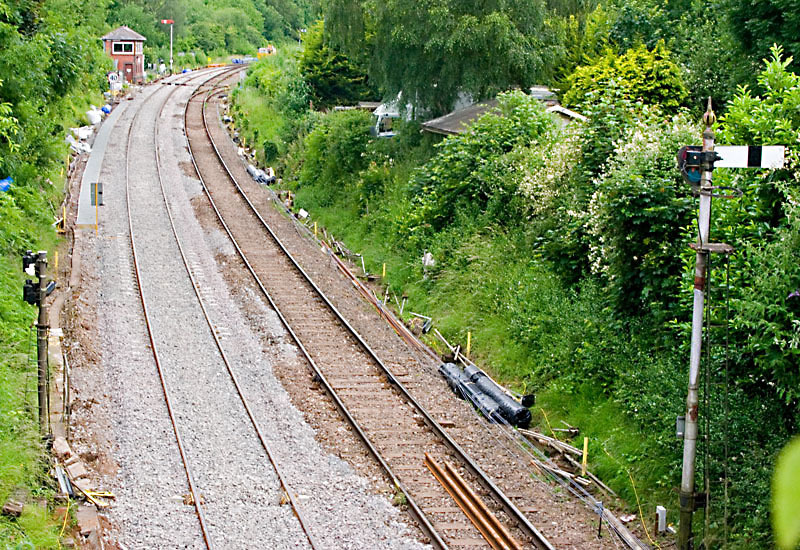 This shows the approach from Great Malvern, with the down homes protecting the entrance to the loop. Ironically, the loop is much more heavily used today than in my youth. A lot more trains terminate at Great Malvern nowadays, and the loop is used to hold terminating trains while the following one to Hereford goes past. The down homes. The ground disc was a later addition. This new-style limit-of-shunt marker, to the rear of the down homes, is a recent addition; there was previously an older-style backlit sign. 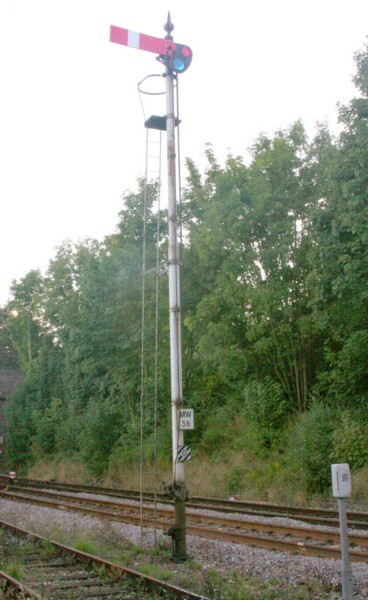 Unlike the even-more-recently installed one at Ystrad Mynach, though, a fictitious signal number hasn't been invented for this one. The down innerhomes, protecting the loop exit points. 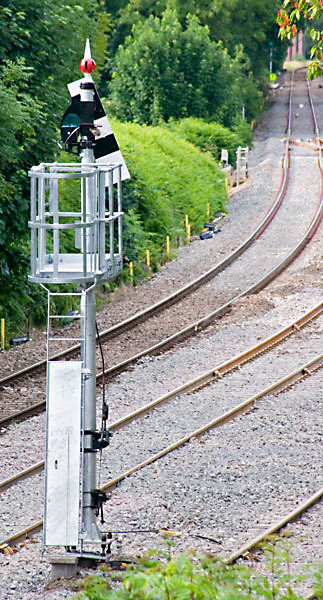 The same signals, viewed from the common beside the line. The trap points guarding the exit from the loop can also be seen. Because there are no trap points protecting the double-to-single junction (see below), these innerhomes are also interlocked with the junction points. 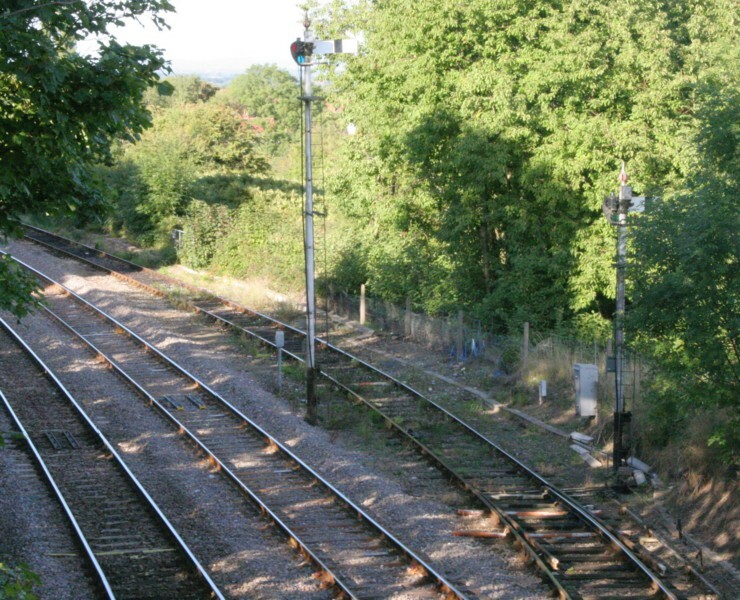 If they are set for the up line, eg Malvern Wells has accepted a train from Ledbury, any down trains have to be held at these signals, even if the train is to be turned round here. The loop innerhome. 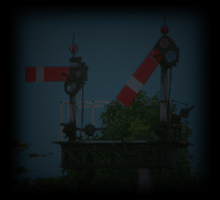 The plate with the diagonal hatching and the figure zero on it indicates the driver of any train held at this signal must phone the signalman immediately. The down main innerhome. Note the telephone on its separate post. A closer view of the trackwork under the Peachfield Road overbridge, with the signalbox and down starter in the distance. The crossover is used for reversing trains that have terminated at Great Malvern, after running them up to the starter. The rear of the shunt-ahead subsidiary below the up starter is also visible. 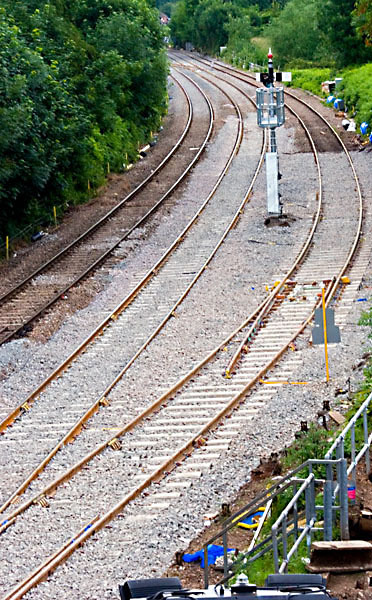 This shot gives an overall view of the layout on the approach from Newland East. A close-up of the up starter. This is the view towards Ledbury from Peachfield Road bridge. 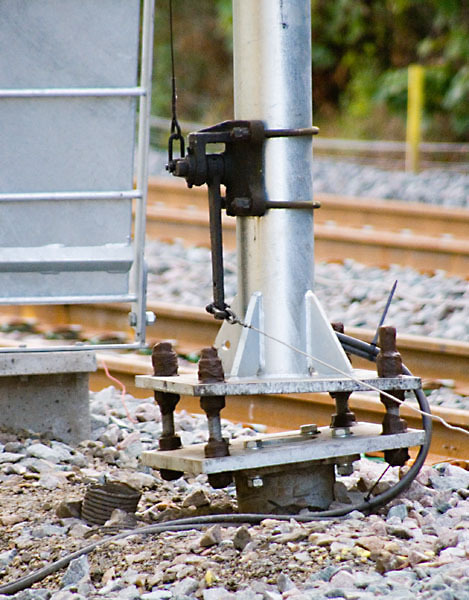 On the right is the up starter, and on the left a pair of elevated disc signals on the left for reversing moves from the down main, either to the up line or back into the loop. 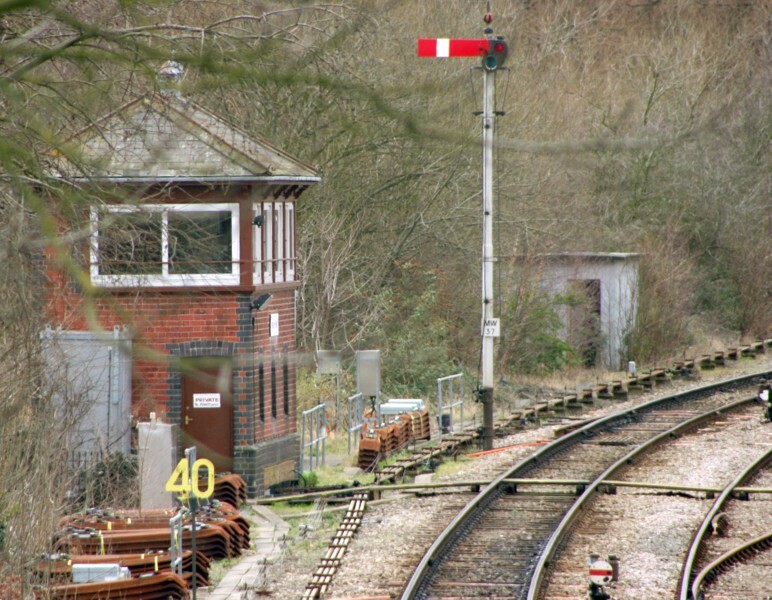 The former station platforms originally occupied the space between these signals and the signalbox; the up starter was originally a taller signal that had a distant for Malvern & Tewkesbury Jct, and later Great Malvern, beneath it. Beyond the down starter is the double-to-single-line junction at the start of the section to Ledbury. 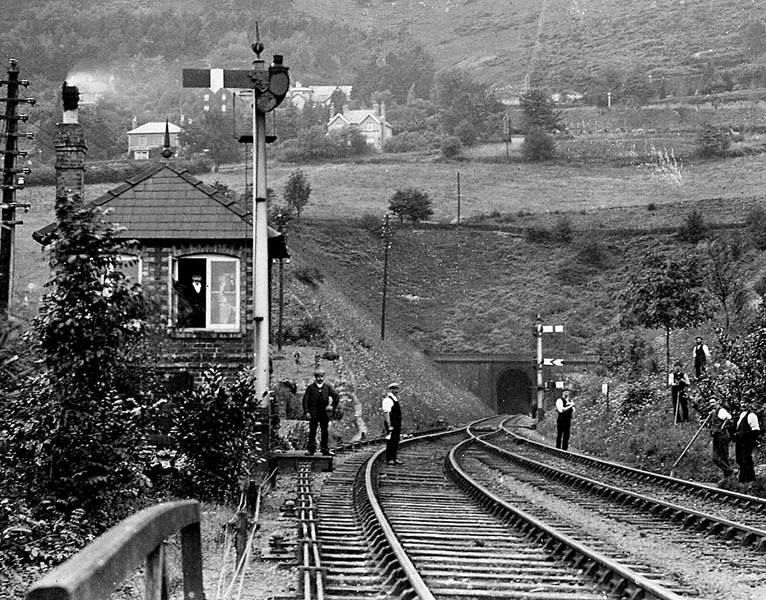 Until the late 1960s, the single-line junction was about a quarter of a mile further on, near the tunnel mouth, and Malvern Wells had an additional down advanced starter and up home there. 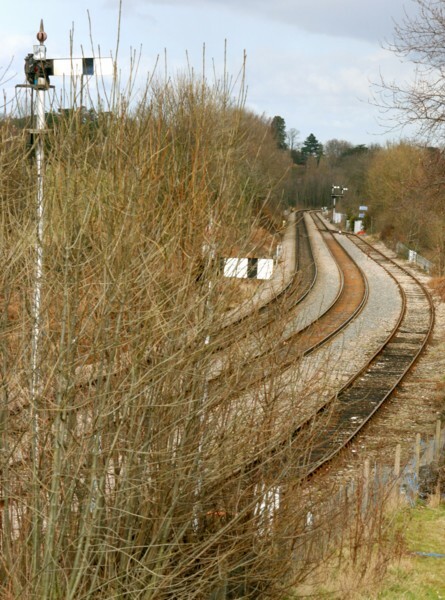 At the site of the present junction was a second trailing crossover. Going back even further, the up siding was originally a loop with an entrance at the original site of the junction. 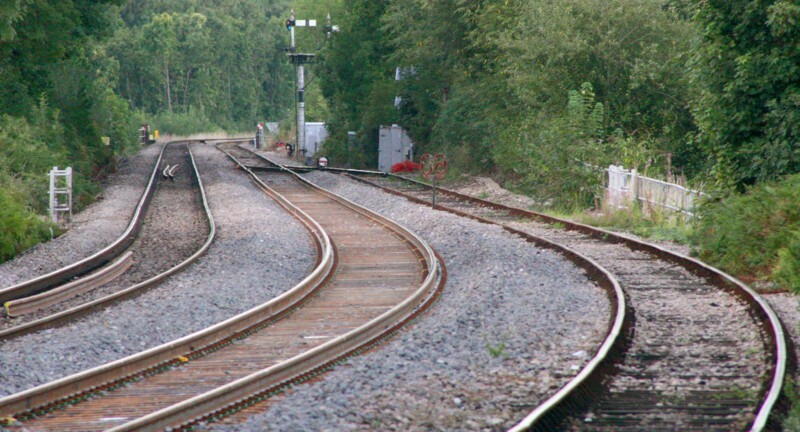 A closer view of the double-to-single junction and the up siding, with the rear of the up home in the background. 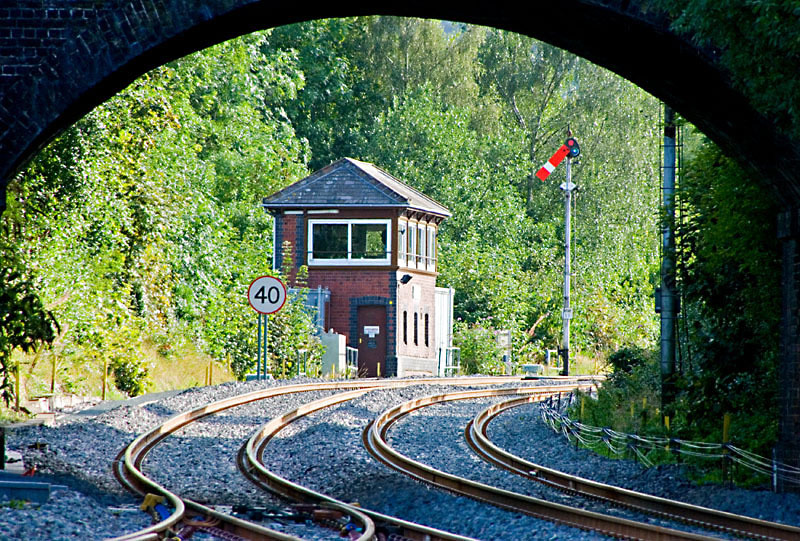 The single line to Ledbury is worked by a unique ex-GWR tokenless system called Lock and Block, which utilises special rotary block instruments with exit treadles at each end to ensure they are not cleared prematurely. The treadle that releases the Lock and Block at this end can be seen in the up main line, directly opposite the disc between the running lines. Just beyond the down starter there is another unusual feature, a catchpoint that can be held closed by a lever in the signalbox. There is also a ground disc immediately beyond the catchpoint to signal any reverse movement over it. All this is a legacy from the earlier layout described above. The line through Malvern is on a significantly rising gradient all the way through to Colwall beyond the far end of the tunnel, and there were originally about five sets of catchpoints between Newland East and here. In steam days there would have been the need to couple locos onto trains standing in the down platform at the station sometimes. The other catchpoints were removed some years ago after the abolition of freight trains that didn't have continuous braking, but this survives to the present day - even though I would not want to be working the signal box if by any chance a rake of unbraked wagons ever were to come rolling back off the single line! A face-on view of the up home (MW3) with the junction and signalbox beyond it. A closer view of the up home. A closer view of the elevated double disc. The down distant, at the end of the platform at Great Malvern station. 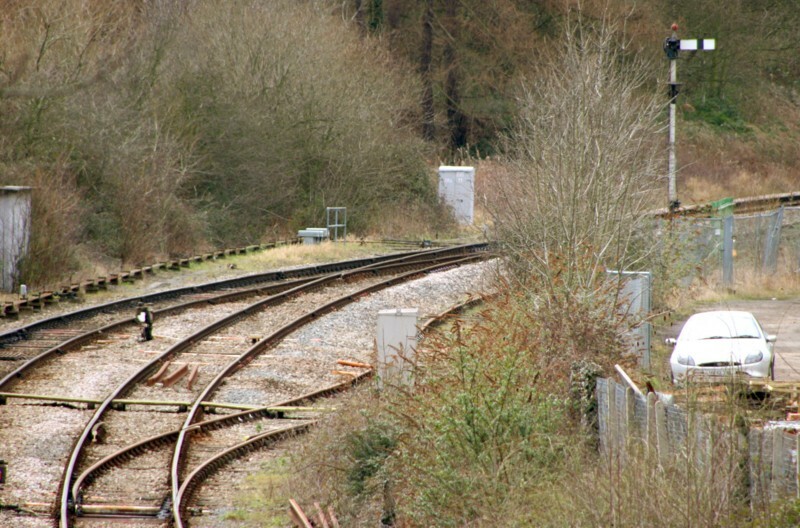 As part of an upgrade and refurbishment programme, the crossover has now been moved a few hundred yards towards Great Malvern - you can just make it out before the line curves out of sight to the left. ...and the down main inner home (right) has been renewed with a centre-pivoted lower-quadrant arm! A new two-aspect LED up advanced starter has also been provided, in advance of the crossover. You can also see the new up advanced starter showing green at the top here. 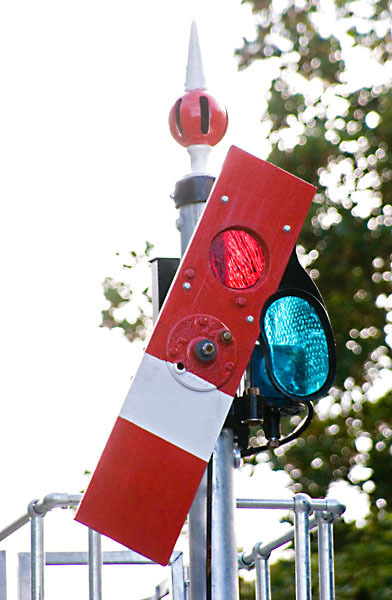 This allows trains to cross over and then wait at that signal even if there is another still in the section to Newland East. 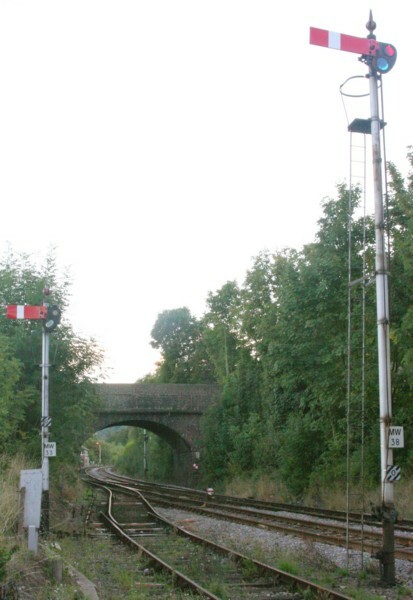 In the former station area, the shunt-ahead signal under the up starter (right), and the lower disc on the elevated former double-disc (left), have been removed. The latter means there is no longer a signalled set-back move into the loop. The new trailing crossover. 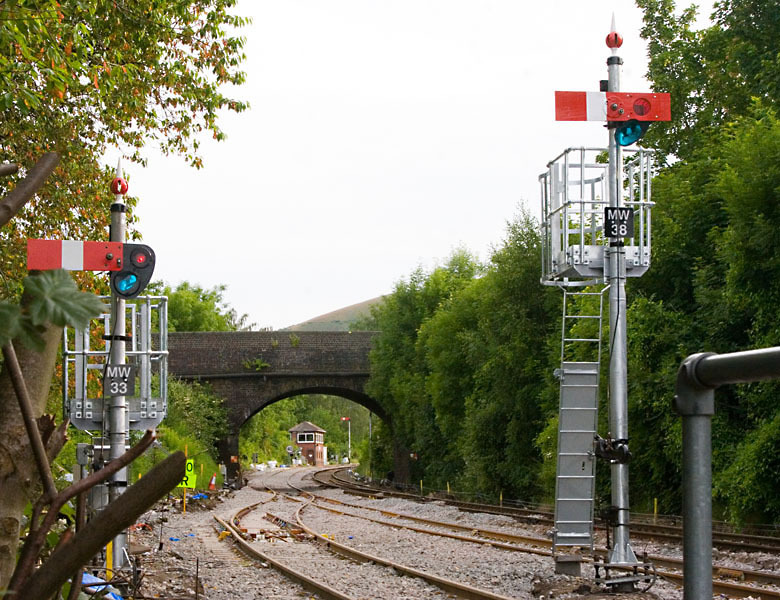 On the far left you can also see a new two-LED limit-of-shunt signal that has been installed for the down loop - this signal displays its two red lights permanently. 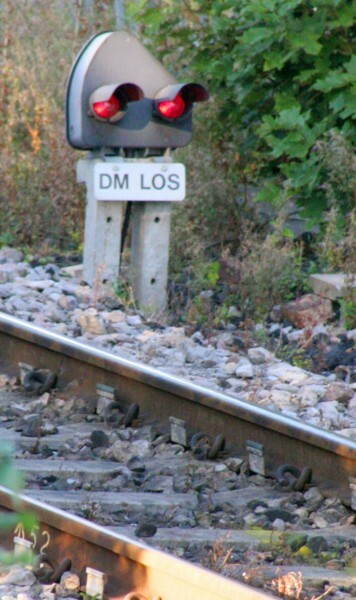 The signalling designers were evidently too stingy to provide an additional shunting signal on the down main opposite the turnout speed restriction sign. This is a pity, as reversing trains could otherwise have shunted directly from here rather than having to run up to the down starter (which can only be done if no up train has been accepted from Ledbury). A closer view of the down main innerhome arm. 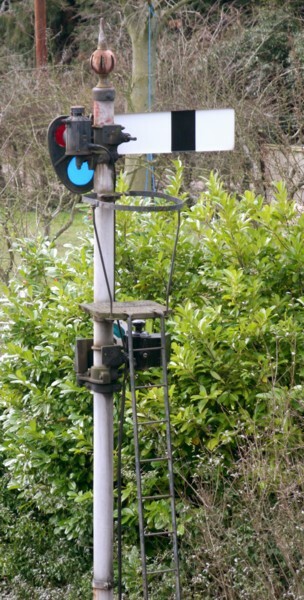 The key parts of this signal were apparently salvaged from Evesham when the Cotswold line was redoubled a couple of years ago, and all the semaphores there were replaced with LED signals. The spectacle glasses, lamp fitting, and probably the actual wooden arm have been newly made, though. 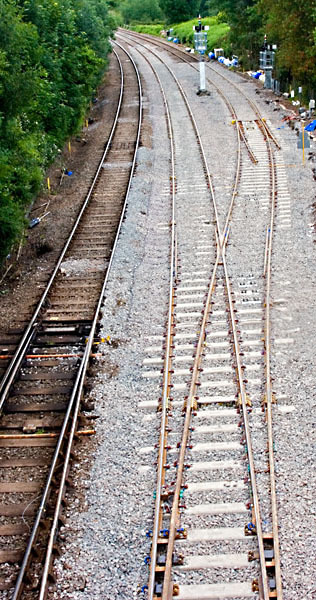 They have also removed the up refuge siding, which hadn't been used for many a year, and nicely relaid all the track. A telephoto view of the box from the Wyche cutting, near the top of the Malvern Hills. 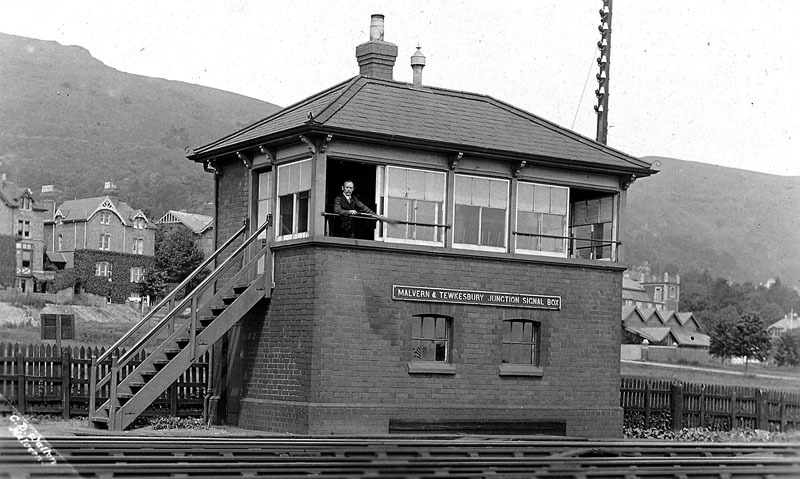 This is almost certainly the original Malvern Wells Tunnel signalbox. According to the SRS Great Western Signal Box Register, the box here was replaced by a GW Type 7D (hipped roof, quite similar to the photo below) on 15/2/1914, so this photo clearly pre-dates then. This box is thought to have been built pre 1881, and is probably a GW Type 1. In the background, of course, is the old Colwall tunnel. It's striking how similar its portal appears to those of the Ledbury tunnel. Also notice how the telegraph wires were run staight up the side of the Malvern Hills! Malvern & Tewkesbury Junction was where the former Midland line from Ashchurch joined the Worcester & Hereford line between Great Malvern and Malvern Wells. 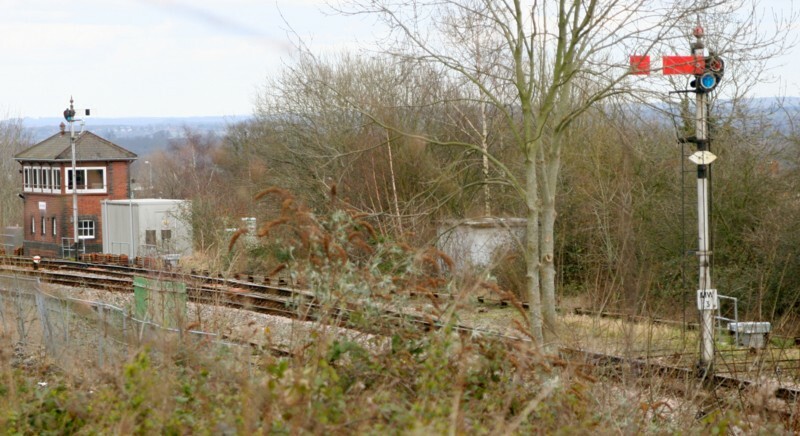 It was sited not far from where today's down homes are, on the opposite side of the track with the Wells common behind. This was a GW Type 7B box, commissioned on 28/5/1905 and closed 14/11/1954, when the Midland line was truncated to Upton-on-Severn. Thanks to Brian Iles of Malvern Museum for permission to use the two photos above.